The BTS owns 13 trolleybuses, one motorbus and a horse-drawn tower wagon. 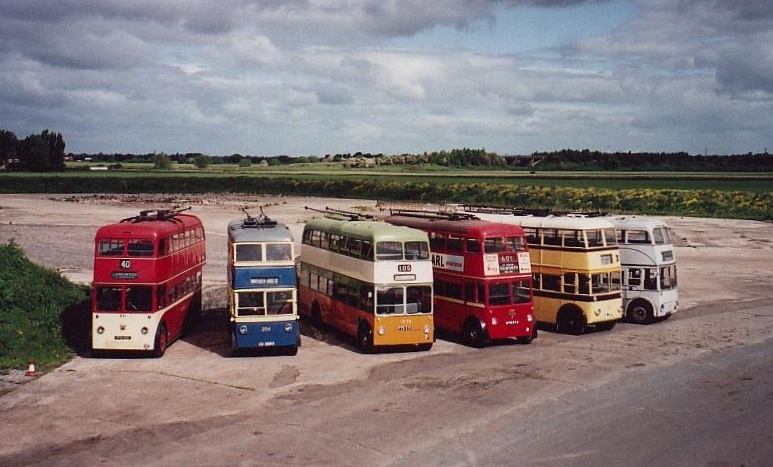 The photograph shows a line up of six of our vehicles at Sandtoft, details of these and the rest of our fleet can be found by clicking on the vehicle's photograph in the table below. Within the information about each of our vehicles you will find a summary of its technical specification, where and when it operated, and its current restoration status. Fully Restored, You can view some photographs of 204's restoration here. Cardiff 203 AEC 664T with Northern Counties H70R bodywork built in 1942 Fully Restored. Bournemouth 99 Sunbeam MS2 with Park Royal H56D bodywork built in 1935 Although restored and operable from 2003, 99 was taken out of service after the Southern Trolleybus Event in May 2007 for some further restoration work to be done. There are some photographs of 99's restoration here. Huddersfield 631 Sunbeam S7 with East Lancs H72R bodywork built in 1959 Restored at Thamesdown Transport in Swindon. Walsall 342 Sunbeam F4 with Brush H65R bodywork built in 1951 Currently stored near Sandtoft awaiting restoration. Walsall 872 Sunbeam F4A with Willowbrook H70RD bodywork built in 1956 The bodywork was restored by Thamesdown Transport in Swindon and 872 re-entered service at Sandtoft in 2017. London 1812 BUT 9614T (Q1) with MCW H70R bodywork built in 1948 Fully Restored. Currently on loan to the London Bus Museum and will return to Sandtoft in 2021. Aachen 22 Henschel 562E-SSW with Ludewig RB61T bodywork built in 1956 Awaiting Restoration. 'William' Tower Wagon Blackwell & Co. horse-drawn tower wagon dating from 1902 The wooden wheels have been refurbished and it is hoped to start restoration on the main bodywork in the near future.